Hi, We are excited to announce that our kennel, Lucky Alien is planning a fantastic Basenji litter, due in May, 2019 from the sire and dam you can see below. We are taking reservations for these pups now, so send us a message or call us if you are interested! Удивительной красоты голова, породная, квадратного формата, изящных линий, близкое присутствие в родословной аборигенных кровей привносит в характер привязанность, нежность и вулкан инстинктов прародителей. Очень стабильно передает красивые головы и правильной формы темные глаза. I've been breeding dogs for 7 years, since 2012. I am a member of the Ukrainian Kennel Union. Basenji is not just a breed of dogs, it's my soul! 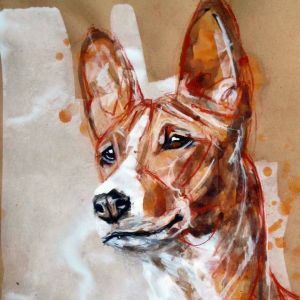 Since 2012 we have grown fond of the Basenji breed. First, the Sante dog appeared in the nursery. We visited exhibitions with him, took a lot of prizes. 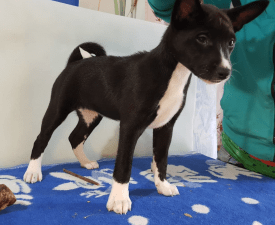 After acquiring the girl Acuna, we plunged headlong into breeding and acquired in the face of the owners of our puppies the best friends, helping them survive important moments in the development and upbringing of the Basenji babes. At the moment, the kennel family has more than 10 dogs. Our puppies live in Greece, Poland, Portugal, Ukraine, Russia. We are always glad to communicate and are ready to welcome you to our Basenji family.